Just one month away now folks! Harry Riley, COL, Ret. is calling upon millions of patriots to march upon Washington D.C. to remove Obama, Biden, Reid, McConnell, Boehner, Pelosi, and Attorney General Holder from Office. 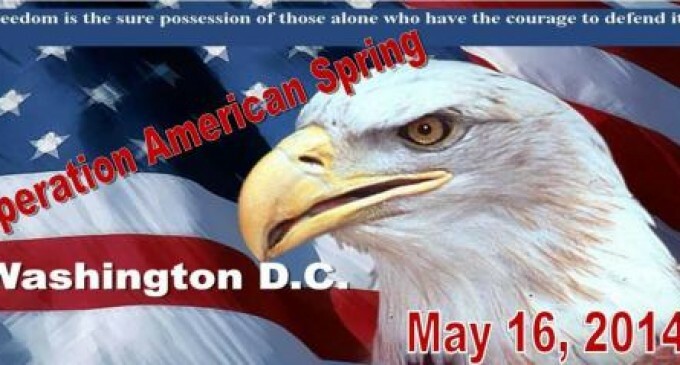 He has termed it “OPERATION AMERICAN SPRING – Beginning Of Tyranny Housecleaning” and it’s due to commence May 16, 2014. Phase 2 – At least one million of the assembled 10 million to stay in D.C. as long as it takes to see Obama, Biden, Reid, McConnell, Boehner, Pelosi, and Attorney General Holder removed from office. God bless Colonel Riley and all patriots in this historic effort to restore our country! One can easily see why this administration fears and loathes veterans. It’s patriots like Colonel Riley that can undo their tyrannical agenda. Let’s make 2014 the year we take our country back! Phase 1 – Field millions, as many as ten million, patriots who will assemble in a peaceful, non-violent, physically unarmed (Spiritually/Constitutionally armed), display of unswerving loyalty to the US Constitution and against the incumbent government leadership, in Washington, D.C., with the mission to bring down the existing leadership. Go full-bore, no looking back, steadfast in the mission. Phase 3 – Those with the principles of a West, Cruz, Dr. Ben Carson, Lee, DeMint, Paul, Gov Walker, Sessions, Gowdy, Jordan, will comprise a tribunal and assume positions of authority to convene investigations, recommend appropriate charges against politicians and government employees to the new U.S. Attorney General appointed by the new President.